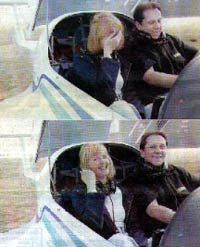 Reynolds covers her eyes, then grins to prove she's really not afraid of going up in the air with Ewatski, the pilot. So the way I figure it is this: Jack Ewatski doesn't really want to die. This is my mantra when our top cop takes me for an hour-long flight in a very small plane. I don't think I'm saying the words out loud but when we're at 3,000 feet and he tells me there are a lot of migratory birds in the flight path and, while he doesn't use the word "splat," I know that's what he's thinking, I raise the volume. "He has a lot going on. He looks happy. He's got friends. Sure, being the chief of police is a tough job, but he's handling it." Deep breath. "He doesn't really want to die." Ewatski recently got his pilot's licence and, for fun and relaxation, he jumps into a tiny two-seater and spends an hour in the air. It's one of the few places he can totally unwind, he says, because the act of flying demands his total attention. When he talks about his passion in the quiet of his office, opera playing gently in the background, it seems like a lovely hobby. Then he asks me if I'd like to fly with him, to help the story, of course. I say yes, of course, because I don't want him to think I'm a spoiled cashmere girl who lets a little thing like possible death get in the way of a good story. I am, but I don't want him to think that. "I always used (CFL) football reffing as a stress reliever," says Ewatski, who decided to take his lessons at Flying Colors partially because he gets to fly out of Winnipeg International Airport. "I thought this would have the same effect. I think dealing with any sort of stressful situation is similar. You revert to your training." Ewatski rents his Diamond Katana from Flying Colors. He's done his 20 hours of ground school and has flown 75 hours. The body of the plane is the size of an apartment-sized bathtub. When we're both inside the cockpit, we're having a physical relationship. The plane has a 36-foot wingspan and, sitting on the runway, it bears a queasy resemblance to those balsa gliders adolescent boys used to build. There's a high to flying that's addictive, says Ewatski, whose endorphins will soon be responsible for keeping me alive. "There's an adrenaline rush. I always get it when I'm taking off," he says. "Once you get up there, it's a feeling of freedom. It's a feeling that's hard to describe. It's still amazing that we can do this. I'm up for an hour, 90 minutes. For that period of time there's nothing else going on." For his 50th birthday, he says, one of his friends bought him a computer flight simulator. Another bought him a book on 100 great aviation disasters of all time. What a card. On flight day, Ewatski explains everything in detail, takes me through the physical check of the plane and explains the gauges. All I hear is: "Check gas, blah, blah, don't touch that, blah, blah, 100-horsepower engine, blah, blah, fire extinguisher, no parachutes." For 45 minutes, he checks and rechecks. This gives me time to reconsider my wasted life. He tells me this is a non-smoking flight, straps the checklists to his thigh and we roll onto a big empty runway. A WestJet plane lands and we wait in our toy plane. Ewatski is given the all clear and we're up in seconds. For 35 minutes, we fly over brown fields, past the town of Selkirk and back to Winnipeg by way of The Forks. I point and obsessively yap, proving I'm not a little bit afraid. Really, really. It's as cool as he promised, not nearly as bouncy as I expected and I'm in good, safe hands. When he lines up the runway to land, I close my eyes. The next day, he tells me his were closed too. What an endorphine-filled cut-up. Jack Ewatski really doesn't want to die. � 2002 Winnipeg Free Press. All Rights Reserved.